Ian Stuart, professor of supply chain management with the Faculty of Management, is working with the Okanagan Valley's wine industry. Ian Stuart, professor of supply chain management with UBC Okanagan's Faculty of Management, is working with the Okanagan Valley's wine industry to design and implement a business plan that reduces wineries' carbon footprint and saves them money by reusing wine bottles in the Valley. "Right now the wine bottles we as consumers take back and get a dime for - they actually get smashed up and broken into pieces," says Stuart. "Some of them get used as landfill; some of them get shipped down to glass manufacturers where they get crushed further and made into new bottles - meaning there's still a lot of energy being consumed throughout that recycling process." Stuart was approached last June by Michael Bartier, winemaker at Road 13 Winery in Oliver, and Stephen de Boer, a former wine-industry consultant, about the feasibility of a reuse system in the Okanagan. He says the reuse system is successfully operating in Canada with beer bottles, and it has found some success in areas in Europe with wine bottles. In other areas, such as California, it has found little success. "We know the system can be done in Canada, because it works with beer bottles," says Stuart. "The question is: How do we replicate that system in our area with wine bottles? Well, we did a rough business plan and it turns out there are some very good advantages for trying the reuse system here, both financially and environmentally." Working in the Okanagan's favour are the geographical proximity of its wineries, and access to a local bottle-washing facility, Mission Bottle Wash, which is the only private bottle-washing plant in Western Canada." One of the main challenges is the fact that wine bottles, unlike most beer bottles, come in different shapes and sizes, so the collection, sorting and distribution of the various bottles could become costly. To solve this issue, the wineries would have to move collectively towards a standardized wine bottle. 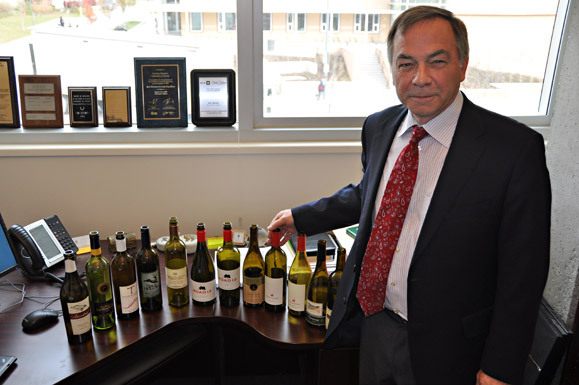 By buying large quantities of standardized wine bottles, Stuart says, wineries will save money right from the start. As well, a new bottle costs anywhere from $.80 to $1.20, which is more than the cost of a reused wine bottle even after the estimated cost of collection and cleaning. "It makes sense for three compelling reasons," says Bartier. "First, our local market is a large percentage of our sales, meaning that the glass physically does not travel far and does not need to travel far to be returned -- essentially this makes the logistics easier. "Second, we have a globally unique situation in that people are already in the practice and mindset of returning their bottles -- this is by far the most difficult aspect of setting up a reuse system, and it is already done." The third advantage, says Bartier, is the Okanagan region's existing infrastructure -- an existing glass-return system and an operating glass-washing facility in the Valley. "There are some logistics to set up but the hard parts have already been done," he says. The reuse initiative has been a topic of conversation amongst various wineries for years, and is being spearheaded by Bartier. So far, 40 wineries have agreed to work together by buying used wine bottles, washing them in Summerland and distributing them among themselves for reuse. The next step will be to create a buying group that will purchase mass quantities of wine bottles, which will lead to the beginning of a standardization of wine bottles among the wineries. As well, committees of volunteers from the wine industry have been formed to look at issues such as the legal structure of the plan, and any technical issues surrounding the bottles themselves. "The wineries that have expressed interest are quite enthusiastic about the idea," says Bartier. "There are some financial advantages to be gained by eliminating the waste stream and there is also a very important and legitimate story that could be used in the marketing of the wineries involved. And, certainly not least, this is the right thing to do aside from the business advantages." "It is a fascinating project -- one that has green and sustainable written all over it," says Stuart. "Eventually the system will have to be owned and operated by the wineries to make sense and have any kind of lasting effect. But I jumped at the chance to be involved - it's a really interesting idea, and one that could work in our region."